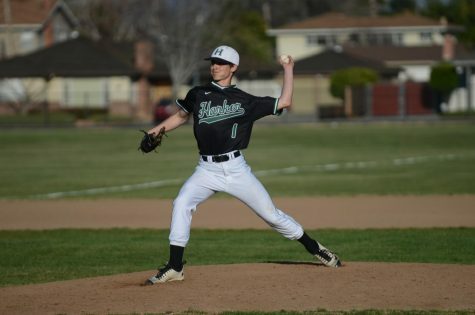 After a strong performance, the varsity baseball team ended this week with two consecutive wins, beating Jefferson High School 6-5 on Tuesday and Crystal Springs Uplands 16-7 on Thursday. 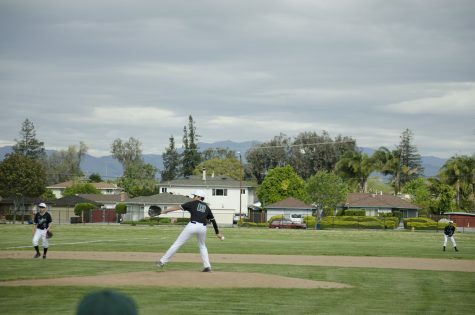 Their game against Thomas More on Friday went three innings before it was rained out with the team up 9-2. 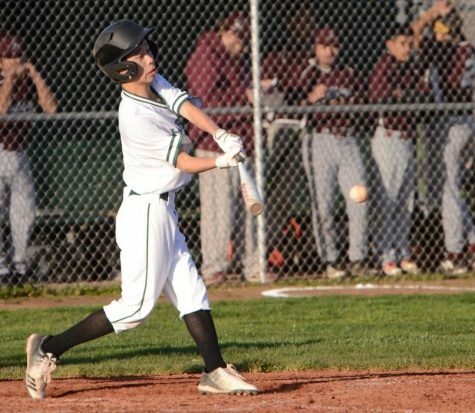 Despite it being cancelled, the Eagles still played well during the match, with strategic hits from freshman Bobby Wang and senior Zachary Hoffman, and a dive for home base by junior Max Lee, garnering yet another point for the home team. 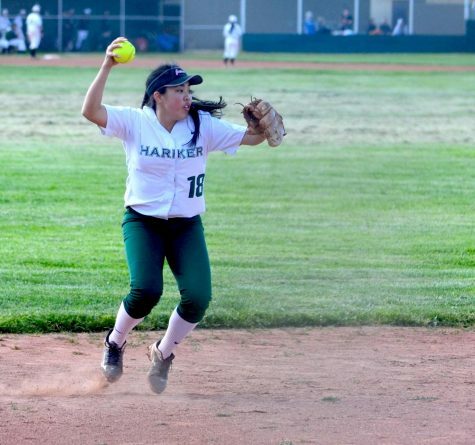 Currently maintaining a league record of 3-1, the team hosts Summit Prep Rainier next Tuesday, March 26, at 4:00 p.m.
After their game against El Camino High School was cancelled due to their opponent’s lack of players, the girls softball team endured a tough loss of 18-7 versus Mercy Burlingame on Thursday and look to improve their 1-4 league record. Next week, the girls play King’s Academy on Tuesday, March 26, and host Mercy High School on Thursday, March 28. 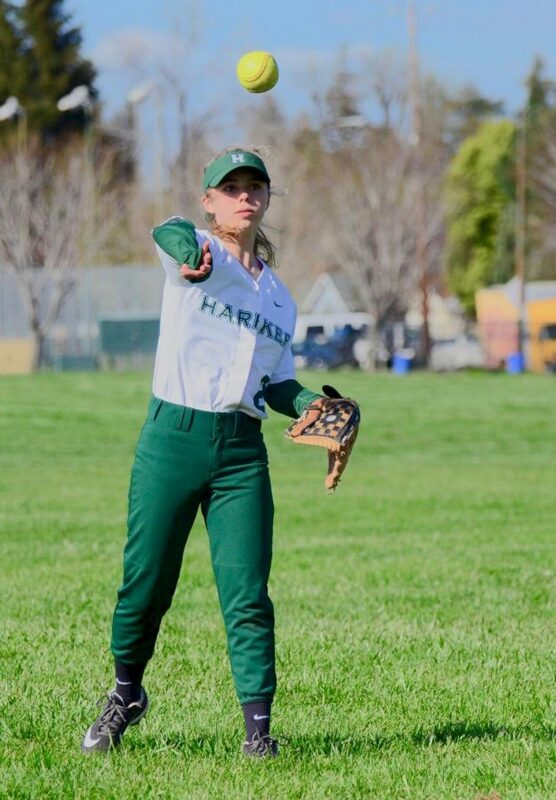 Freshman Elizabeth Fabel throws the ball during the softball team’s game against Mercy Burlingame on Thursday, which ended in an 18-7 loss. Next week, the girls play King’s Academy on Tuesday, March 26, and host Mercy High School on Thursday, March 28. The boys varsity golf team defeated Sacred Heart Preparatory School on Tuesday with a final score of 204-229, another victory in an almost undefeated season. Leading the way for the Eagles was sophomore Aditya Tadimeti, who earned a medalist honor after shooting two over par 36. Gabriel Yang (10) and Bowen Yin (10) both finished with scores of 41, closely followed by Ashwin Rammohan (12) and Bryan Zhang (10) at 42. Next week, the team plays Sacred Heart again on Monday, March 25, and competes at the Champions Invitational all day on Friday, March 29. Winning their first league game 12-3 over Sequoia High School on Friday, the girls lacrosse team improves their overall record to 4-2 and their league record to 1-0. Highlights include Elise Mayer (12), Anna Vazhaeparambil (10), Piper White (11) and Heidi Zhang (12) all scoring goals, and goalie Nellie Tonev (11) blocking the majority of the opponents’ shots. The girls host Aragon High School next Tuesday, March 26, and Notre Dame High School next Thursday, March 28. 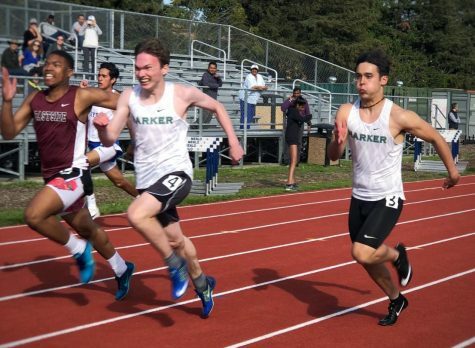 During the WBAL Jamboree, hosted at Harker on Thursday, the Eagles competed against Crystal Springs, Menlo, Notre Dame, Nueva, Pinewood and King’s Academy and had a strong performance overall. 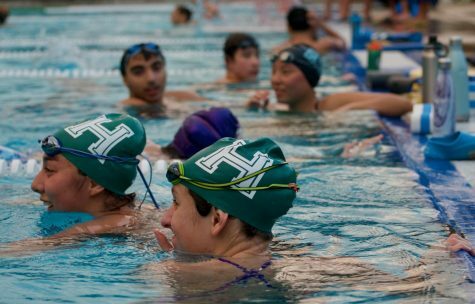 The boys relay team of Matthew Chung (10), Rhys Edwards (10), Ethan Hu (11) and Jason Kwok (10) won the 200 freestyle and 200 medley events, while the girls relay team of Alyssa Huang (11), Nikela Hulton (9), Sinaya Joshi (9) and Ihita Mandal (12) took first for the 400-yard freestyle. Additionally, Rhys and Alex made the CCS cut times in their individual events, the 500-yard freestyle and the 200-yard medley, with Rhys winning both races and Alex taking third and second respectively. 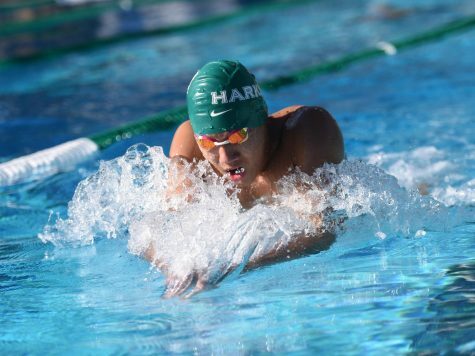 Matthew also placed first in the 100-yard freestyle and 100-yard breastroke events, and Ethan Hu (11) took the 100-yard butterfly and 100-yard backstroke. Finally, freshmen Nikela Hulton and Jay Thilking both had impressive showings: Nikela won the 200-yard individual medley and 100-yard butterfly, while Jay the 100-yard freestyle. The team continues to prepare for their next meet on Thursday, March 28, as they hope to achieve more CCS qualifications. 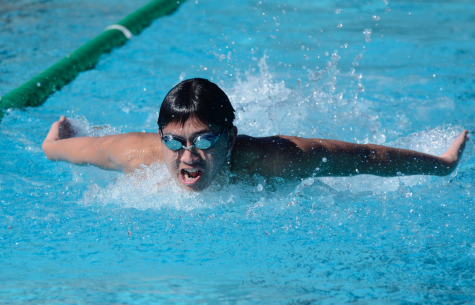 Senior Alex Yu practices his butterfly stroke during swim practice on Monday, March 18. The team continues to prepare for their next meet on Thursday, March 28, as they hope to achieve more CCS qualifications. The varsity tennis team defeated Crystal Springs Uplands 5-2 on Monday and King’s Academy 6-1 on Thursday, improving their league record to 7-1. The boys host Sacred Heart Preparatory School next Monday, March 25. The junior varsity team also beat Crystal Springs Uplands, finishing with a final score of 4-3. Their season comes to a close as they approach their final game against Menlo in the upcoming month, a specific date yet to be determined. The track and field team performed well during the St. Francis Invitational Track Meet last Saturday, their third meet of the season. The distance medley relay team of Ryan Adolf (12), Arya Maheshwari (10), Alex Rule (12) and Henry Wong (12) placed in the top 20, finishing with Harker’s second best time in history, and the 400-meter freshmen-sophomore team of Andrew Chen (9), Anton Novikov (10), Rosh Roy (10), and Bayden Yazalina (10) earned fourth place in their event. The team next competes at the WBAL Meet on Tuesday, March 26. 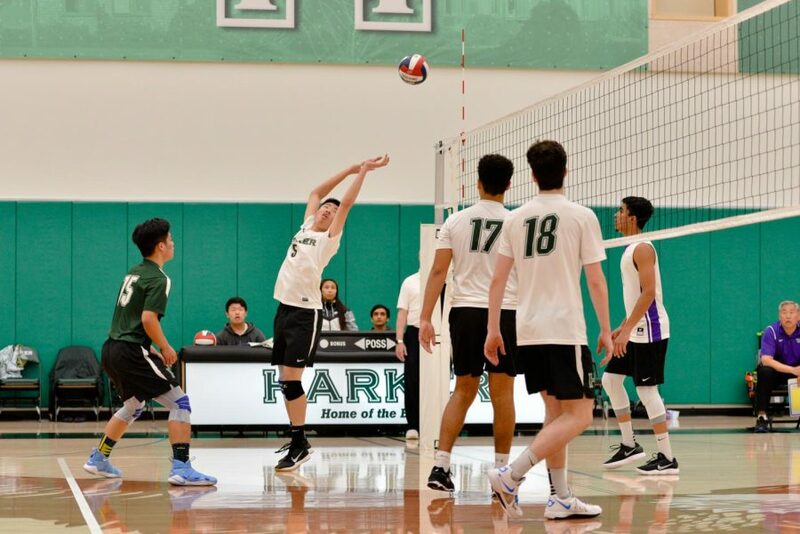 Despite defeating Los Gatos High School 3-0 on Wednesday, the varsity boys volleyball team broke their undefeated league record after losing to rival Monta Vista High School 3-2 on Friday. They also competed at the Monta Vista Volleyball Tournament on Saturday, making it to the finals before losing 2-0 to Monta Vista once again. 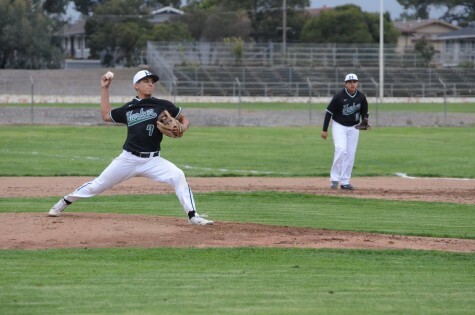 The varsity team currently has a league record of 8-1 and an overall record of 18-3, while the junior varsity maintains a league record of 0-4 after losing to Los Gatos 2-1 and Monta Vista 2-0 this week. 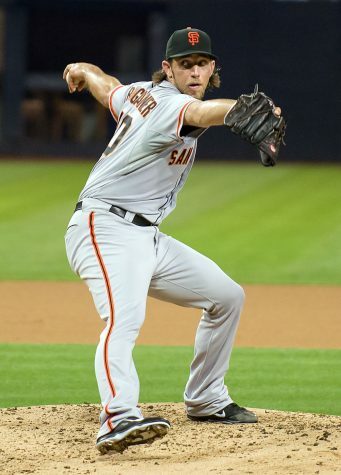 Both teams will play Los Altos High School on Wednesday, March 27, and Lynbrook High School on Friday, March 29. Jeffrey Kwan (11) hits the volleyball over the net during Friday's game against Monta Vista High School. 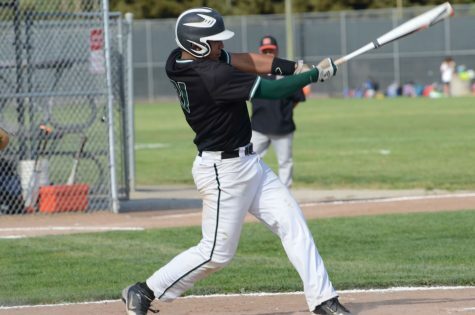 After losing 3-2 during the game and 2-0 during the finals of the Monta Vista Tournament on Saturday against the same team, the Eagles now hold a league record of 8-1 and an overall record of 18-3.